Wear Plate is a duplex material consisting of a very tough and highly wear resistant alloy overlaid into a shock absorbing mild steel or chromium steel backing plate. These properties render this product suitable for use under extreme operating conditions where the cost of downtime far outweighs the initial expenditure or the capital outlay of replacement. Download the WEARCO Wear Plate Catalogue (4.4MB). Dozer Moldboards. Shovel Liners. Chute Liners. Dragline Buckets. Classifier Screens. Mine and Quarry Skips. Pug Mill Paddles. Compactor Rollers. Bucket Lips. Dipper Buckets. Ore Cars. Ore Scrapers. Dump Truck Body Beds. Loaders and High Lifts. Skid Plates. Blast Furnace. Coke Oven and Sinter Plants. Skip Car Liners. Sinter Breakers. Ore Bucket Liners. Receiving Hoppers. Grizzly Bars. Feeder Bins. Conveyor Buckets. Chutes. Spiked Roll Crushers. Pulveriser Mills. Cyclones. Receiving Hoppers. Liner Plates. Coal Handling Systems. Coal Buckets. Conveyors. Fan Blades and Housings. Grain Chutes. Rub Bars for Conveyor Chains. Agitator Paddles. Dredge Pump Liners. Grit Blast Liners. Centrifugal Pump Liners. Mower Skid Plates. The mechanically strong interface between the alloy and steel backing is clearly depicted in this cross sectional photograph of Wear Plate. Wear Plate will outlast quenched and tempered steels by up to 12 times and white irons up to 4 times. This means that when compared to these other Wear Plates, Overlay Wear Plates will provide increased wear life for the same weight. Wear Plate offers substantial weight savings for the same wear life as heat treated alloy steels or white irons where handling or weight factors are a consideration. Wear Plate is quickly polished by abrading materials, producing a surface with a low coefficient of friction. This discourages hangs-ups, maintaining the efficiency of chutes, bins, hoppers, buckets and other material handling equipment. Wear Plate has a true weld-bead structure which produces a keyed-in interface of alloy and steel. This characteristic peak and trough interface results in a surface area between the alloy and steel backing which is up to 20% greater than with other duplex materials. Wear Plate has very fine and consistent relief checking ensuring a low stress interface. This means that Wear Plate absorbs greater impact as well as being extremely conducive to rolling or pressing. Rating Wear resistance under controlled testing procedures by NATA certified and approved experts produced the above typical results. They included tests for abrasion and impact under both high and low stress conditions. However any rating is dependent on a number of variables, such as the type of testing procedure adopted, the type of test carried out (high stress abrasion, low stress abrasion), the load applied in the test, speed variations, calibration anomalies etc. Results “in the field” do vary markedly according to the type of material, impact loads, speed of flow, support structures, consistency of flow and material, particle size, particle shape, correct machinery calibrations and other criteria. Hardfaced Wear Plate has achieved results as high as 30:1 over mild steel and as low as 12.6:1. Plasma arc is the preferred method, however, arc air and friction disc are also effective. Hardfaced can be bent by either press brake or rolling (Wear surface inside) to a diameter of 600mm. To form Hardfaced to smaller diameters (200mm min) it is recommended that 4mm on 8mm and 7mm on 10mm be used. Forming Hardfaced with the wear surface on the outside, a minimum of 1 metre diameter is recommended. Forming should be carried out at right angles to the weld runs. The low carbon steel substrate of Hardfaced Wear Plate can be welded using normal consumables for MMAW and GMAW for mild steel. 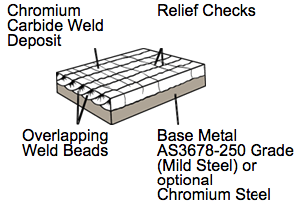 The wear surface has negligible yield strength; hence no structural welding should be performed on this surface. It is important when weld preparation is carried out, that any dilution from a structural weld into the hard facing will result in carbon pick up and likely cracking of the weld.